In October 1835 Nicholas and Deborah Wicksell joined the Second Congregational Church in New London Connecticut. The Second Congregational Church was formed in April 1835 when 19 members of the First Church of Christ in New London left due to overcrowding. Nicholas and Deborah can be found in the “Manual of the Second Congregational Church in New London Conn. 1880” on page 39. Nicholas is listed as member 72 while Deborah is number 83. Both are listed as dismissed in 1846. 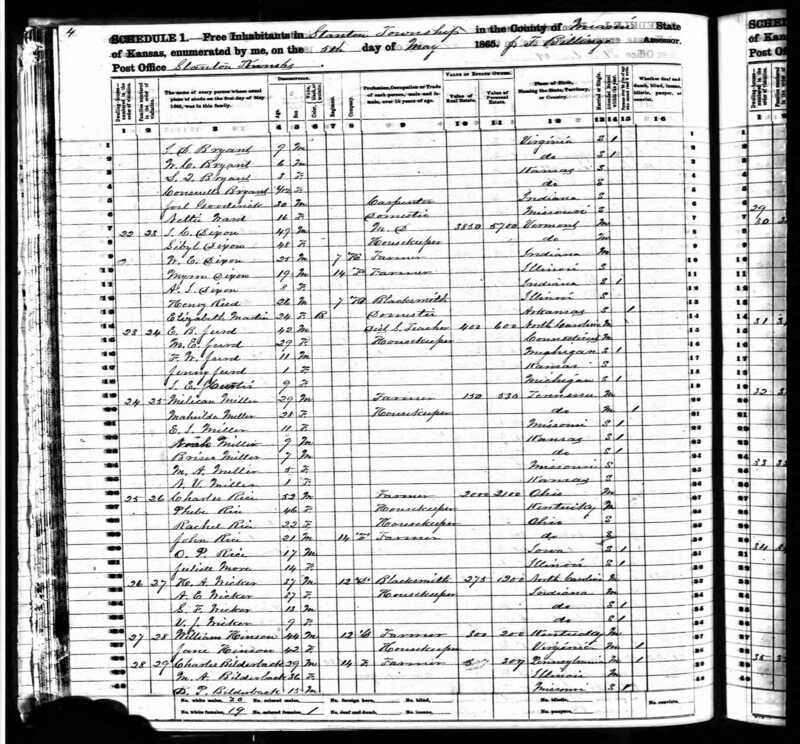 The 1840 United States Federal Census lists Nicholas Wicksel in Waterford, New London Connecticut around June 22nd of that year. Unfortunately the 1840 Census only lists the “Names of Heads of Families” with simple counts and family member age ranges. The census lists one male between 5 and 9 years, one male between 60 and 69 years, One female under 5 and one female between 30 and 39. 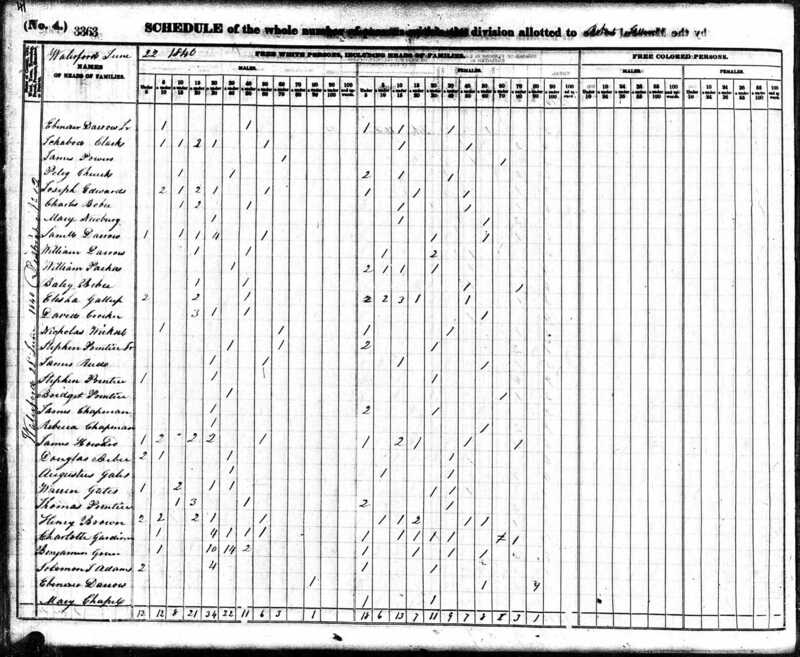 The 1840 census causes two problems. First Nicholas appears to be too old. Based on the 1860 Census, Nicholas should be 56 in 1840, not 60 plus. Since the 1860 census is so specific and the 1840 census is just a tick mark in a column, I would guess that the 1840 census is in error. The second problem is the number of children in the home. At the moment this is the only record than links Nicholas and Deborah with two children. The first child is well documented as Joseph Wicksall born on July 29th 1835 in Connecticut. I believe the second child is Mary E Wicksall born in 1836 in Connecticut. I have a significant amount of circumstantial evidence linking Mary as the daughter of Nicholas and Deborah. On April 27th 1846 Nicholas and Deborah Wicksall join the Second Presbyterian Church in Oswego New York. They can be found on page 6 of the “Records of the Second Presbyterian Church of Oswego, N. Y.” copied by Mrs. Minnie L. W. Kellogg. In the 1840's the Oswego Post Office advertised a “List of letters remaining in the post office at Oswego NY” in The Oswego Palladium newspaper. They would generate a list on the first of each month and then run that list for two or three issues. In the case of the Palladium that would be two or three weeks. 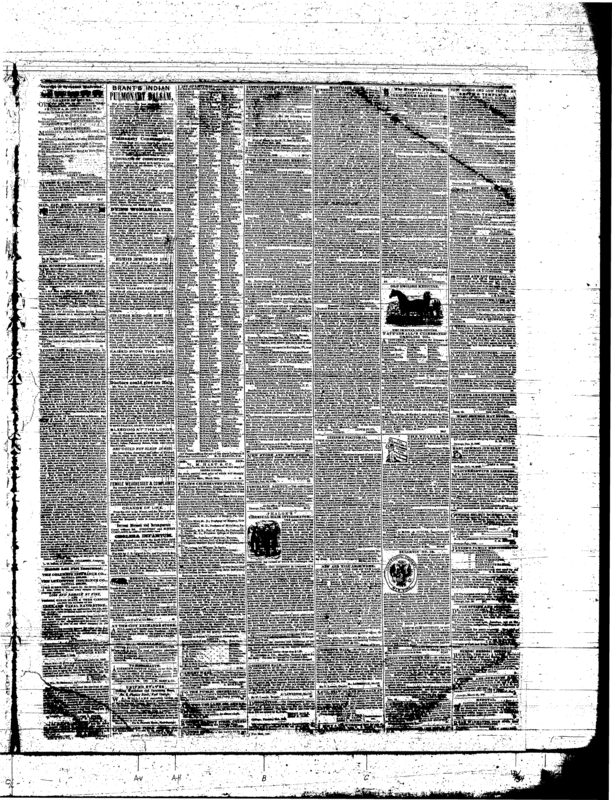 The Oswego Public Library has several years worth of newspapers on microfilm so I started going through the Palladium beginning with issues in early 1845. Although these issues are available online, the microfilm image quality is far superior to the digitized copies. The first hit for "Wicksell N" is in the 4th, 11th and 18th issues of January 1848. The next interesting entry is for "Wixell Deborah" in the 5th and 10th issues of September 1848. I don't know if this is Deborah Wicksell but it seems likely that it is another misspelling of the name. The last hit is for the 3rd, 10th and 17th issues of April 1849. 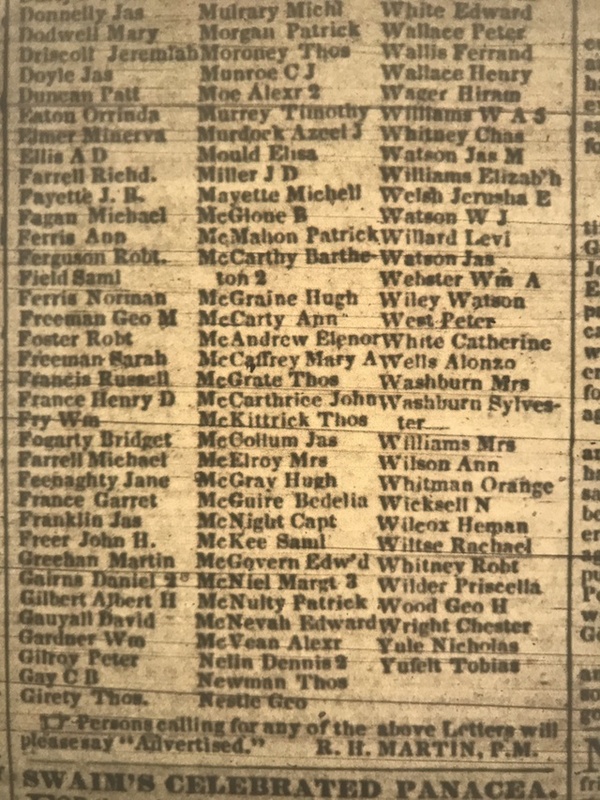 A screenshot of the April 10, 1849 list and a digital copy of the April 17, 1849 issue (3rd column, bottom right in "list of letters") shows “Wicksell N” on the list. I don’t know how long the post office would hold on to mail in the 1840’s, but this may mean the Wicksells picked up the mail before May 1st and were therefore in Oswego as late as May 1849. Beginning in July of 1849 the post office begins advertising the "List of Letters" in the "Oswego Daily Commercial Times". There is an interesting article titled "The Post-Office Advertising" in the July 10, 1849 issue of the Palladium that discusses the change in depth. So far I have searched from July through October of 1849 with no further mention of the Wicksell name in the Commercial Times. 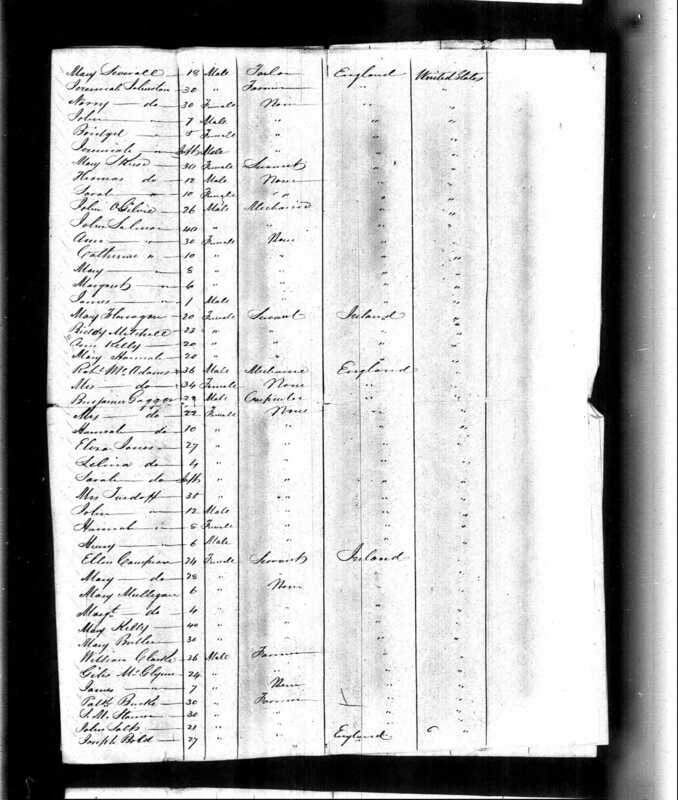 Here in the 1850 Federal Census in Oswego New York we have a family of 4 with the names Nicholas, Deborah, Joseph and Mary. Nicholas is a Sailor born in Scotland while the reset of the family is listed as being born in New York. The ages of Nicholas, Joseph and Mary are all reasonable as of "the first day of June, 1850". What doesn't match is the last name. Ancestry has the name transcribed as "Minor" and Family Search has it transcribed as "Merion". I'm sure both are wrong. For one thing the first letter resembles the other capital W's on this page and is clearly different than the M's. This looks like one of the many examples of the Wicksall name being badly misspelled. The “Fayette House” was a hotel frequented by those travelling west. 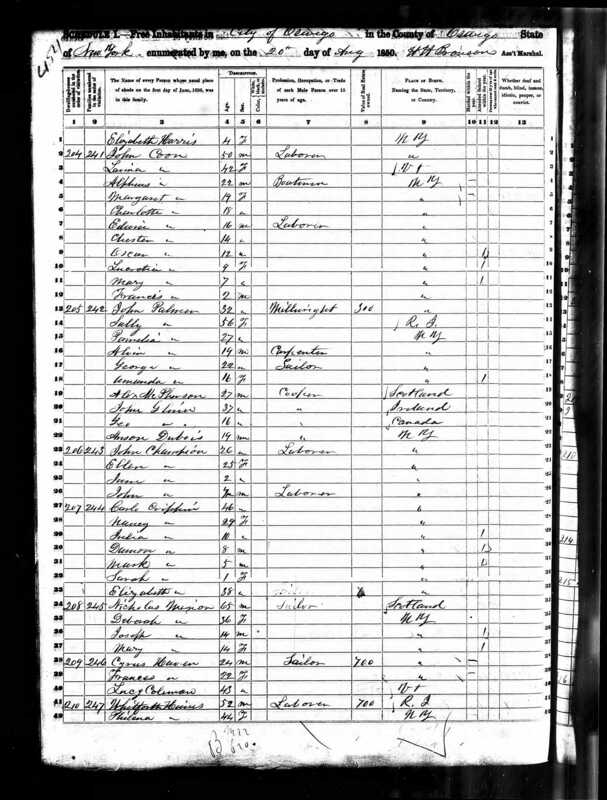 The remainder of the Curtiss family appears to have stayed in Oswego and shows up on a later Census. 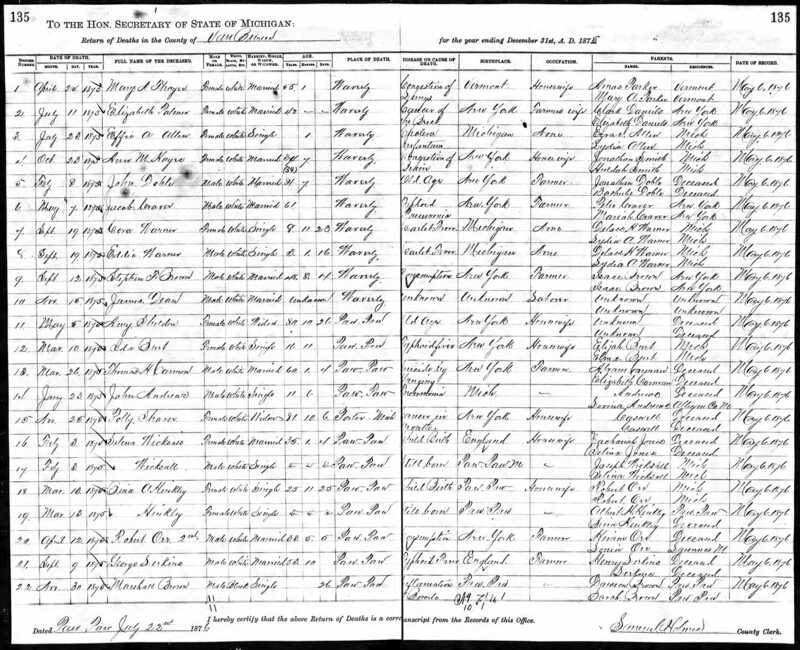 Based on later census records, Mary’s son Frank Wallace Curtiss was born around 1854 in Michigan and Mary’s daughter Ida E Curtiss was born around 1856 in Michigan. One family tree has Nevins Curtiss listed as dead on the 30th of August, 1857 although I don't have an official source. Selina was born around 1840 in England. Although there are some records that say New York, most point to England. There is a family tree on Ancestry.com which lists Selina's birthplace as Oxwich, Glamorgan, Wales. I have been unable to find any other proof of this. Selina's death certificate lists her parents as Zachariah and Selina Jones. This presents another challenge as I have been unable to find a husband and wife with those names. 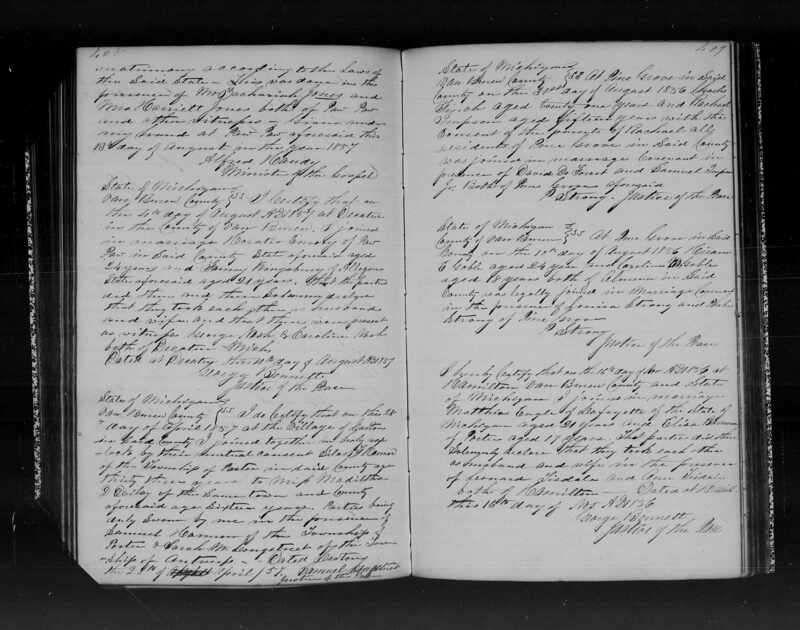 I have however found a baptism record for a Selina Jones with the father listed as Zachariah and the mother listed as Eliza with a birth date of January 1st 1840 in West Yorkshire, England. 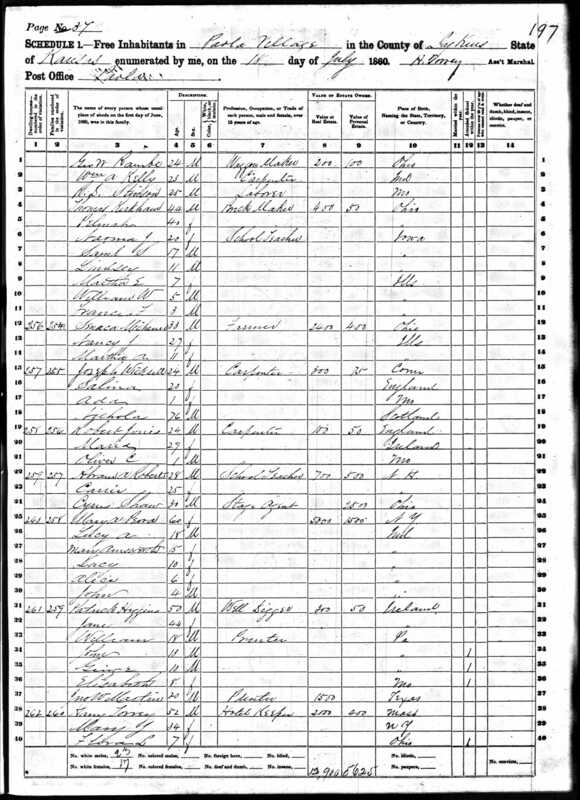 There is also the 1860 United States Federal Census that lists Zachariah Jones living in Paw Paw with Hariet A. aged 33, Eliza A. aged 14, Franklin aged 11, Eva age 6 and Ella age 2. The names match Selina's marriage certificate and my guess is that Harriett is Zachariah's second wife. 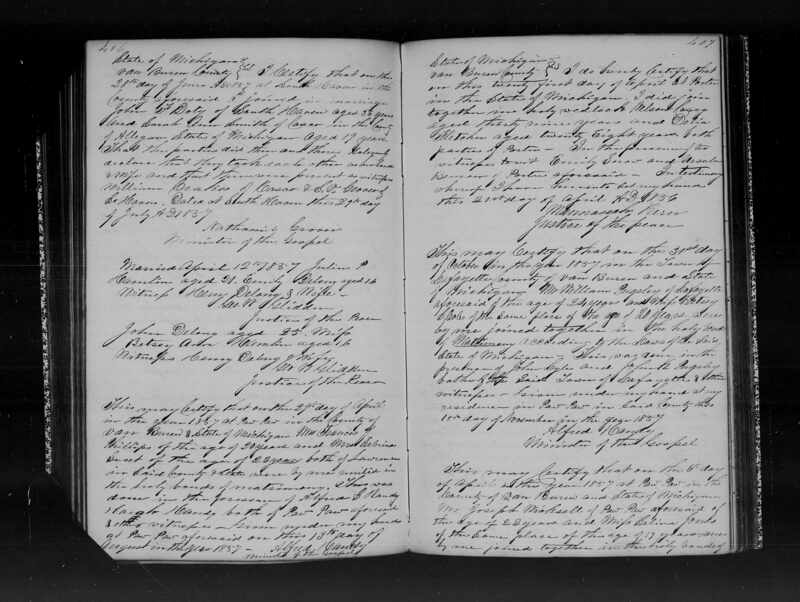 Additionally, there is a Passenger list for a ship arriving in New York in 1844 from Liverpool England which lists Eliza Jones aged 27, Selina aged 4 and Sarah infant. It appears that Zachariah may have arrived in New York on July 17th 1843 on a ship named Elisha Denison. In 1859 Joseph and Selina’s first child Ada U Wicksall was born in Missouri. Ada’s birth date and location is derived from various census and marriage records. Right on cue Mary E Curtiss gets remarried to Edward B Jurd on March 17th 1859 in Kansas City, Jackson County, Missouri. There are multiple sources on the web for this marriage and the original certificate can be found on Ancestry. 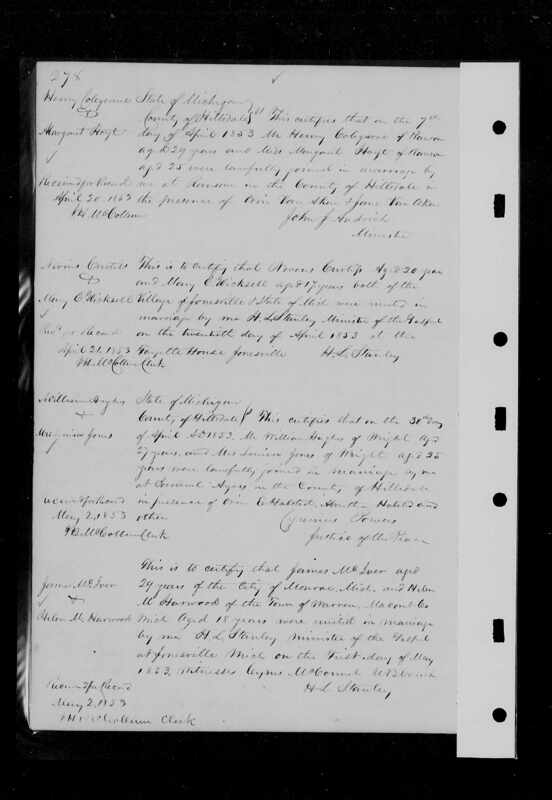 One source is "Missouri Marriages, 1750-1920," database, FamilySearch (https://familysearch.org/ark:/61903/1:1:V28J-7C3 : 6 December 2014), Edward B. Jurd and Mary E. Curtiss, 17 Mar 1859; citing Jackson,Missouri; FHL microfilm 1,019,757. 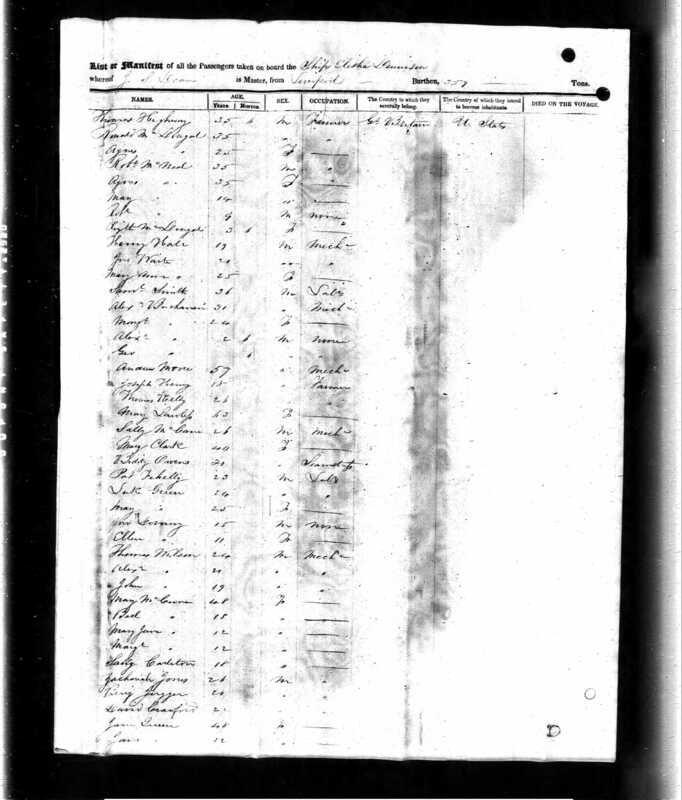 The 1860 United States Federal Census for Paola Kansas lists the Wicksell family as living in Paola, Lykins, Kansas Territory. Nicholas (Nichola) is listed as 76 years old and born in Scotland which would mean he was born in about 1784. Joseph Wicksall is now 24 years old and listed as a carpenter born in Connecticut. Salina is listed as 20 years old born in England and Ada is 1 born in Missouri. Deborah is no longer with the family and I am unable to find any record of her death. 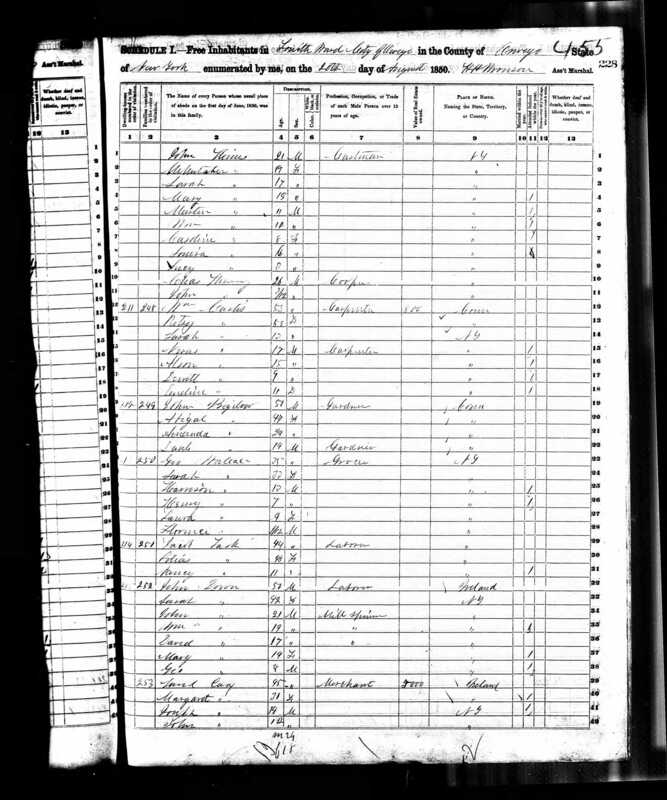 The 1860 United States Federal Census for Stanton Kansas shows that Mary has once again followed the Wicksall family. This time the Jurd family is living in Stanton Kansas in the county of Miami which is about 12 miles West of Paola. In 2016 Stanton isn’t much more than an intersection with a cemetery. 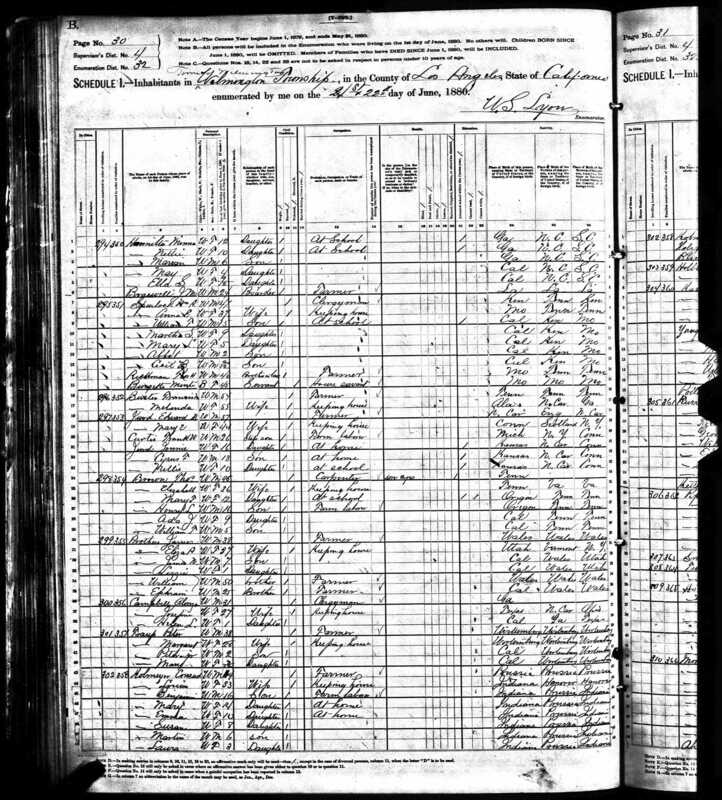 The census lists Edward B Jurd age 37, Mary E Jurd age 26, Franklin W Curtiss age 6 and Ada Curtiss age 4. On April 30th 1861 Joseph and Selina’s first son William Hamlin Wicksall is born in Salina, Kansas. The source for his birth place is William's son's birth certificate. This certificate was requested many years after the fact so it is possible that his birth place is confused with William's mothers name. Salina Kansas did exist at the time so it certainly is possible. Salina is about 180 miles west of Paola Kansas and is a logical stop for a carpenter looking for work. 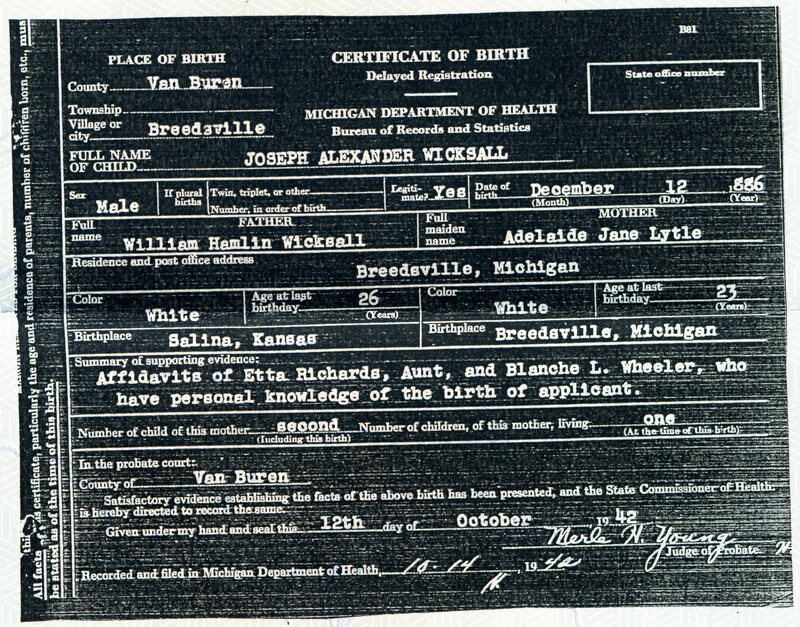 As far as I can tell, all of the Wicksalls living in Michigan today are descendants of William. Somewhere between 1861 and 1863 Joseph and his family head back to Michigan. 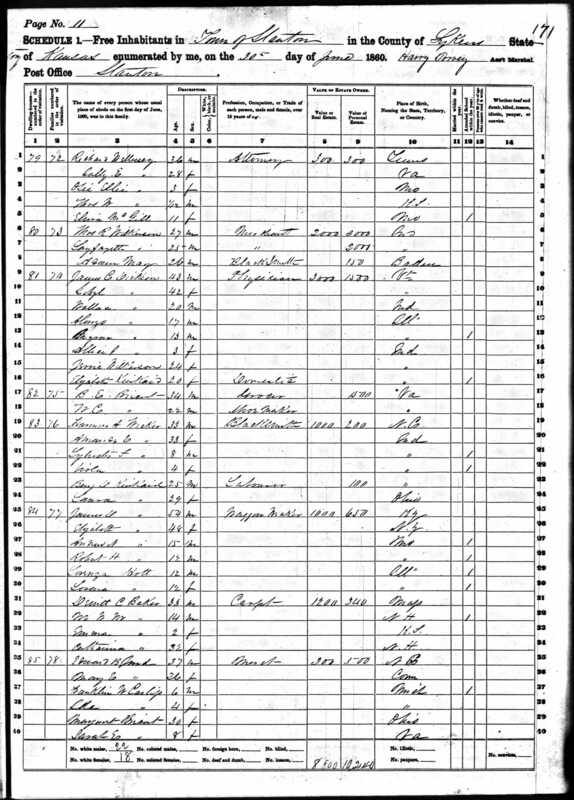 The 1865 Kansas State Census shows that while the Wicksells have headed back to Michigan, the Jurds have remained in Stanton Kansas. Edward Jurd is a 42 year old Teacher born in North Carolina. Mary is a 29 year old housekeeper born in Connecticut. The children get a little confused here. Frank Wallace Curtiss is listed as F. E. Jurd age 11 born in Michigan. Next is one year old Jenny Jurd born in Kansas. Last is a female I. E. Curtis age 9 born in Michigan. It looks like the last child's name was originally written as Jurd and corrected to Curtis. Mary and Edward Jurd stay in Kansas at least until 1870. They are still in Stanton, Miami, Kansas on the 1870 United States Federal Census. Edward is now listed as a farmer. By now Edward and Mary have had three children Jennie, Cyrus F and Nellie E Jurd. The two Curtiss children are also still here. Frank works on the farm and Ida at age 14 is at home. In 1880 the Jurd’s are in Wilmington California where their son Edward Alvin Jurd is born on September 16th 1880. The family is also on the 1880 United States Federal Census in the same town. This census shows Mary born in Connecticut, Her father born in Scotland and mother born in New York. Frank Curtis is still with the family but Ida Curtis is now gone. Jennie, Cyrus and Nellie are still with the family. Mary Jurd’s final link back to the Wicksall family is shown on her daughter's death certificates. 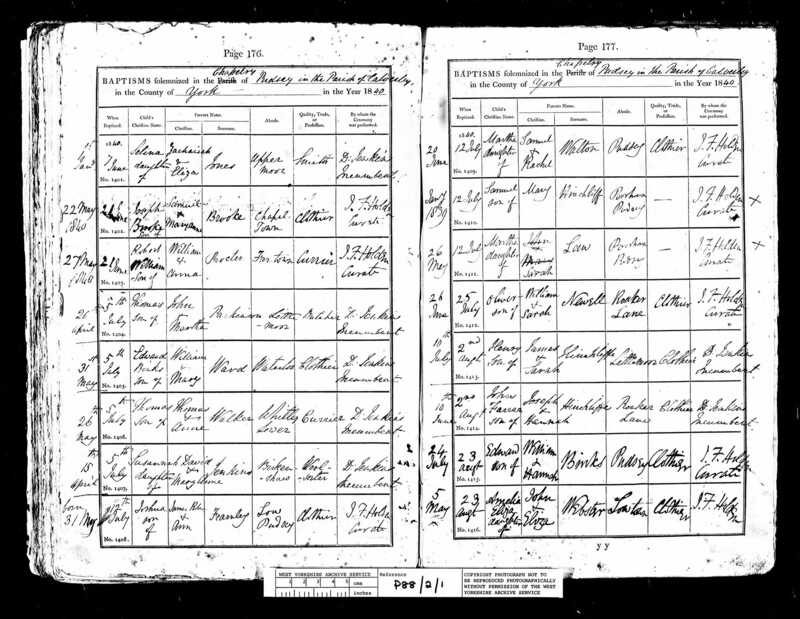 On Jennie Champion’s March 18th 1948 death certificate (https://familysearch.org/ark:/61903/1:1:VG5L-R5X) her mother's maiden name is listed as Wickersall. 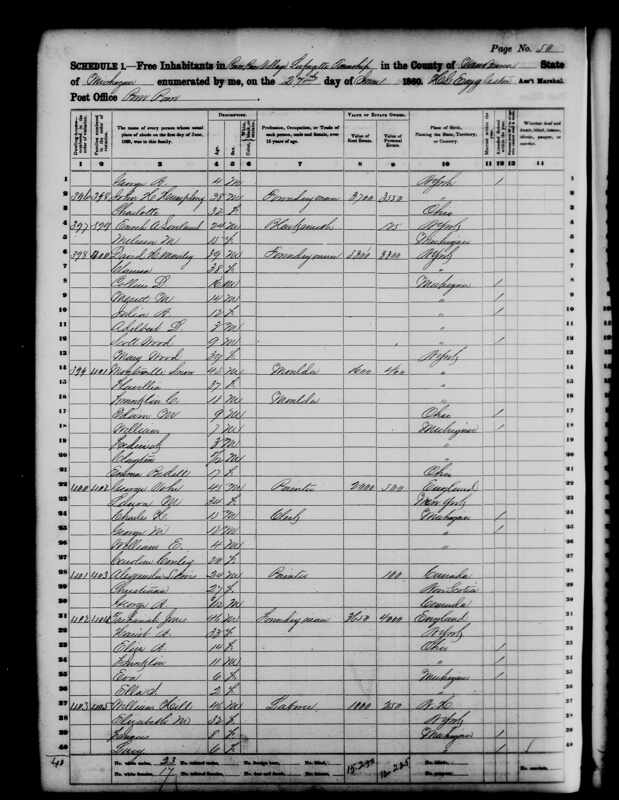 On Nellie Emily Choate’s May 10th 1950 death certificate (https://familysearch.org/ark:/61903/1:1:VP7Q-BLG) her mother’s maiden name is listed as Wicksall. Mary’s own death certificate is missing.